Having served as a driving force during the formative years of the Atlantic Institute for Market Studies, Purdy Crawford was our passionate fundraiser, our spirited Chair, and one of our greatest champions. Purdy believed that ideas matter, that good ideas must be effectively communicated, and that they need to be supported with facts. AIMS is the embodiment of that belief. 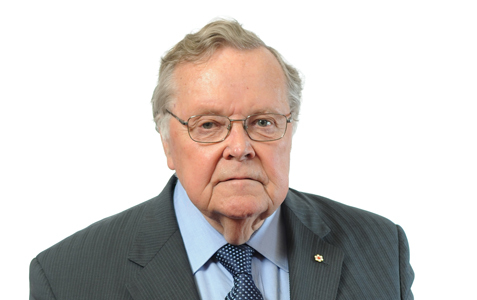 In 2013, Purdy Crawford, together with AIMS’ current Chairman, John Risley, established The AIMS Purdy Crawford Fund to ensure that the institute would have the resources needed to continue providing evidenced-based research and ideas that support the prosperity of the Atlantic Region. Purdy Crawford passed away in August of 2014. The AIMS Purdy Crawford Fund is a testament to the legacy left behind by one of Atlantic Canada’s most influential forces in business. Our goal over the next two years is to seek major gifts in honour of Purdy, a fiercely loyal Atlantic Canadian and one of Canada’s most respected businessmen. The AIMS Purdy Crawford Fund is about establishing a legacy in the name of a great Atlantic Canadian. For more information on the AIMS Purdy Crawford Fund, please contact Marco Navarro-Genie at aims [at] aims.ca or by calling (902) 429-1143. AIMS produces books, papers, research reports background papers and Commentaries that are available on our website. We also issue an electronic newsletter newsletter, The Beacon, featuring the current work of the Institute. The Friends of AIMS program is designed to provide tangible benefits to supporters, while shedding light on important issues of public policy. The program hosts prominent speakers for breakfasts, luncheons, and policy seminars on important issues around the Atlantic region. Our core research team and our internationally recognized academic fellows employ the highest standards of excellence in every piece we publish; and, over the past 20 years, AIMS has developed an extensive library of top-quality policy-related papers that serves as a rich resource for political and business leaders, and the community at large. As an important voice in advancing fiscal prudence and market solutions, AIMS is a vital institution for Atlantic Canada. The political and economic issues facing the region cannot be resolved by the existing framework of government-led economy and reliance on transfers from the central government. Going forward, bringing public expenditure within the bounds of our means is the only way to ensure that the pillars of government in our region – healthcare, education, and public services – remain viable. Your charitable contribution will help us build a stronger legacy and make a difference in Atlantic Canada.